Surprisingly enough, I’m writing another post less than a week after my last one. It helps that it’s summer, and it helps even more that one of the truck gatherings I went to this week I didn’t even know was a gathering until I got there! Man, I love it when that happens. We’ll start, however, with last week’s event at Hiller Aviation. 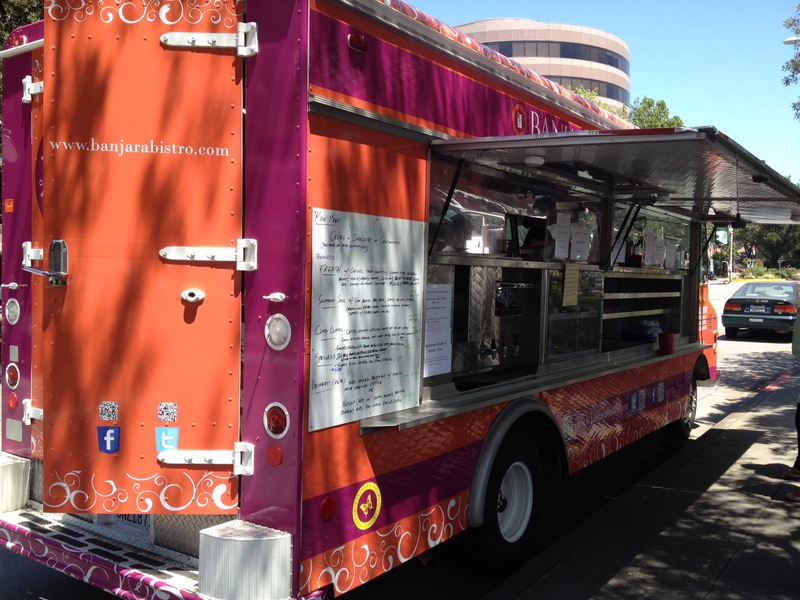 This weekly event happens every Wednesday and is put on by The Mobile Gourmet. 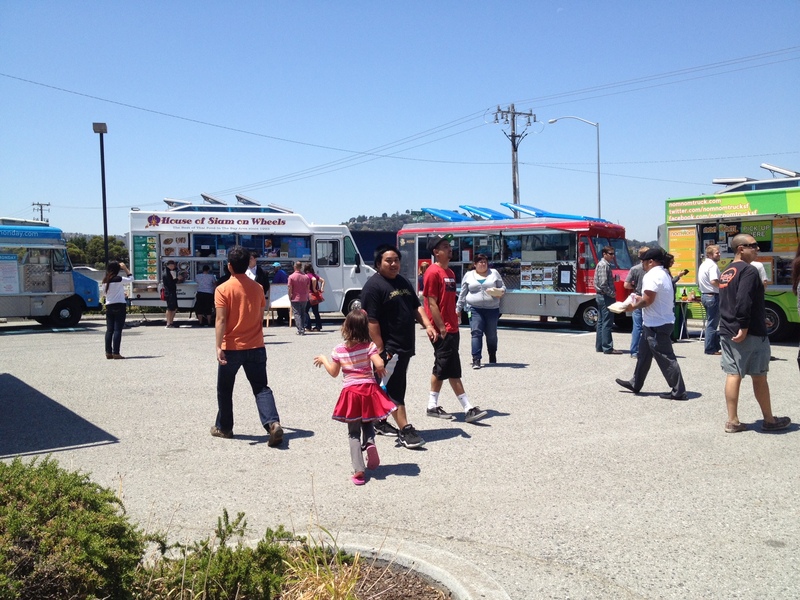 I have known about Hiller for a few months, and during the school year I was constantly looking at the truck list and lamenting the fact that I was working and couldn’t drive up to San Carlos to taste some of the trucks that don’t always make their way down to the south bay. I knew when school was out I had to check it out at least once, and I’m glad I did. What I found was a very organized event. 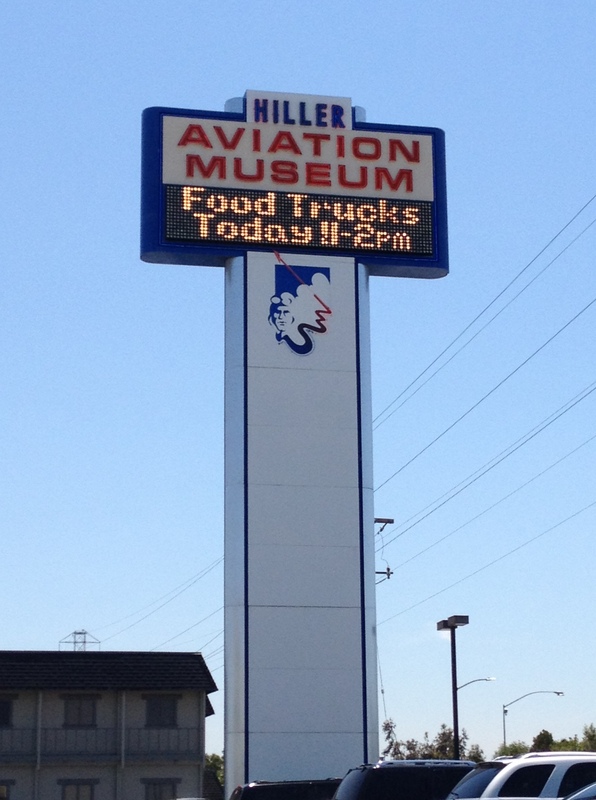 The museum’s sign even welcomed the trucks! There were many people scoping out the trucks along with me. 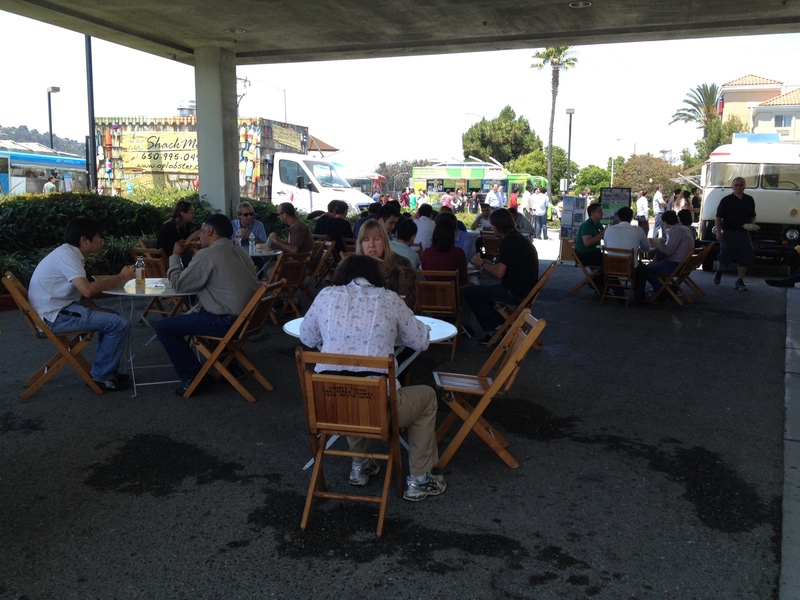 Another touch I appreciated was that they had tables set up for people who wanted to enjoy their food there. I always appreciate a gathering that comes with seating. After enjoying the scenery, I zeroed in on the trucks and made my choices. I decided to go with Senor Sisig first since I had only seen them twice before and hadn’t tried everything on their menu for vegetarians yet. This time I went with their sisig nachos with tofu on top. 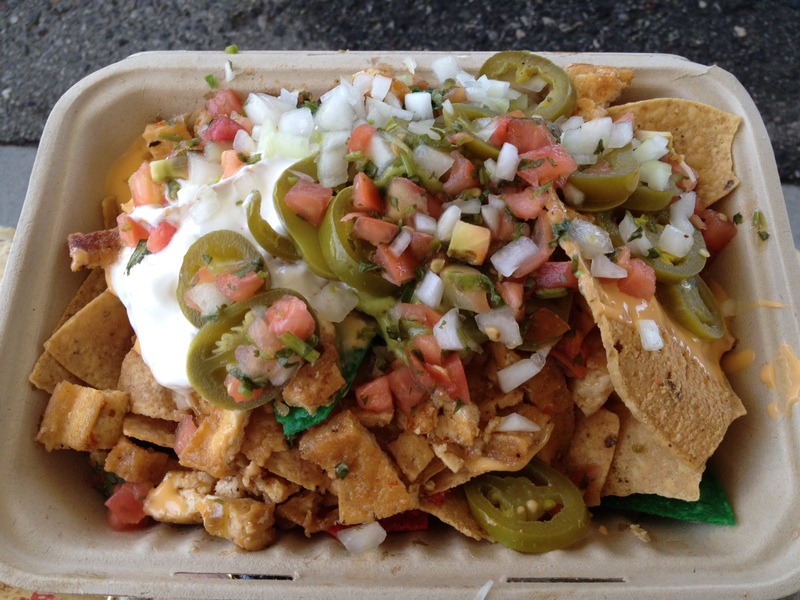 I had never had tofu on nachos before, and I don’t know why more people don’t offer it as an option. It was delicious! I also got a tofu taco from Nom Nom since I rarely see them as well, but I didn’t take a photo since I’ve posted one here before. 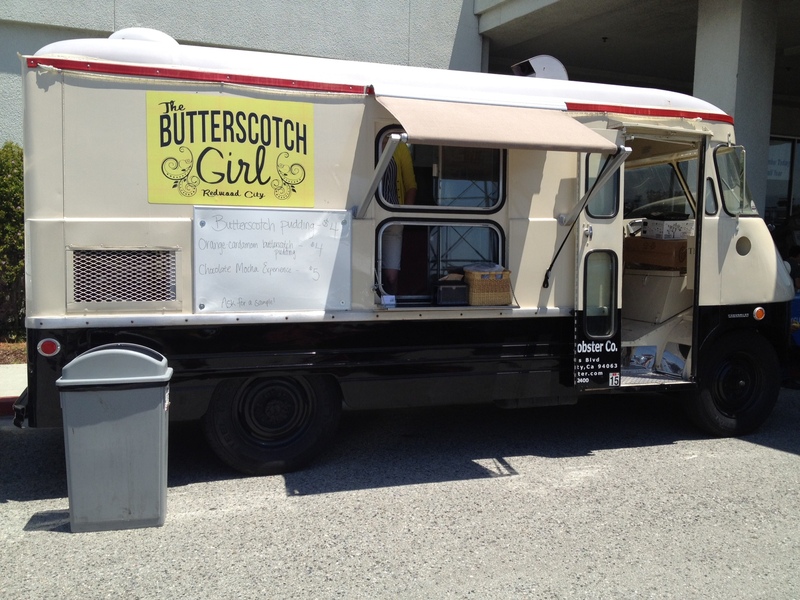 Finally, I got a chance to check out The Butterscotch Girl. 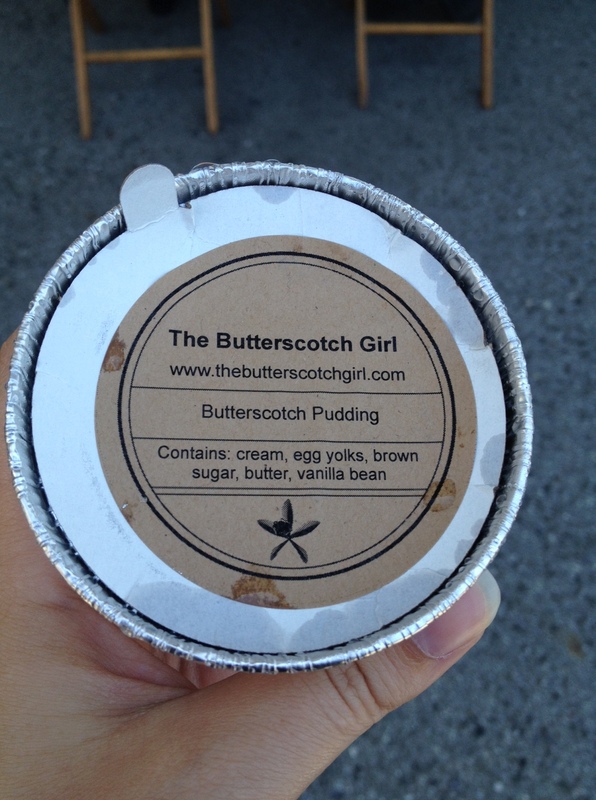 Since Butterscotch on the Go stopped hitting the streets, there had been a lacking in butterscotch at food truck events, and I was excited to try this new take on butterscotch pudding. 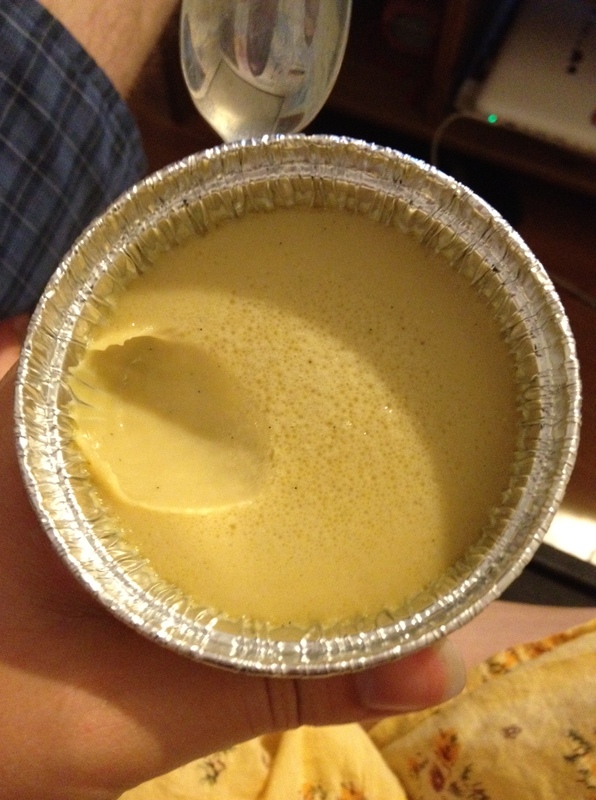 I ordered two of the flavors, one of the regular butterscotch pudding and one of the orange cardamom butterscotch pudding, and took them to go so I could share them with Kyle later. 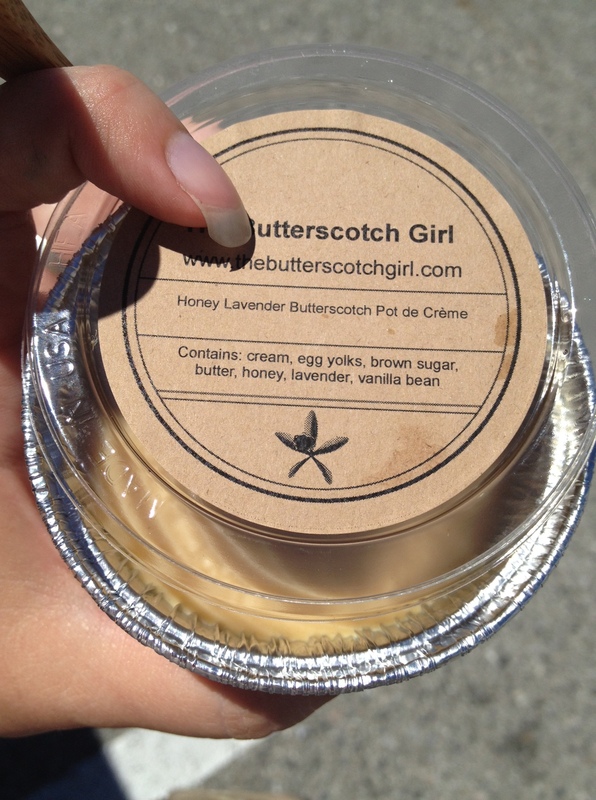 I liked how both were served in a container that told the ingredients, leaving nothing a mystery. Later, when we enjoyed our pudding, we found them to be quite similar, except the orange cardamom had a hint of orange flavoring to it, naturally. Kyle preferred the orange cardamom, and I preferred the plain butterscotch, but we agreed that they were both quite tasty. 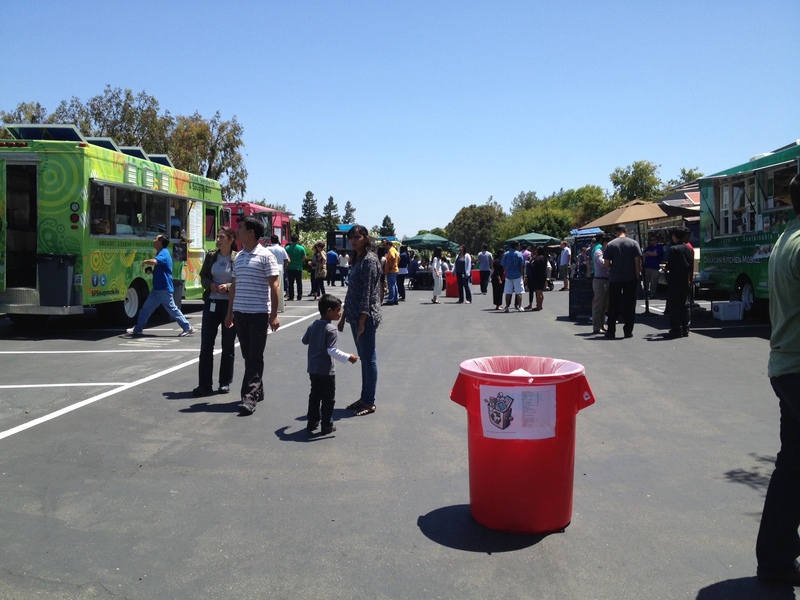 On Friday, I headed out to Mountain View to find SF soupmobile again. They had mentioned on facebook that they were at coupons.com with six other trucks at a public event, but I hadn’t seen any other trucks mention it. I figured as long as they were there, I was interested, so I drove out and was surprised to find not one, not six, but NINE trucks gathered at coupons.com! Signs that were posted explained that it was a private gathering from 11-12:30 and public from 12:30-2. 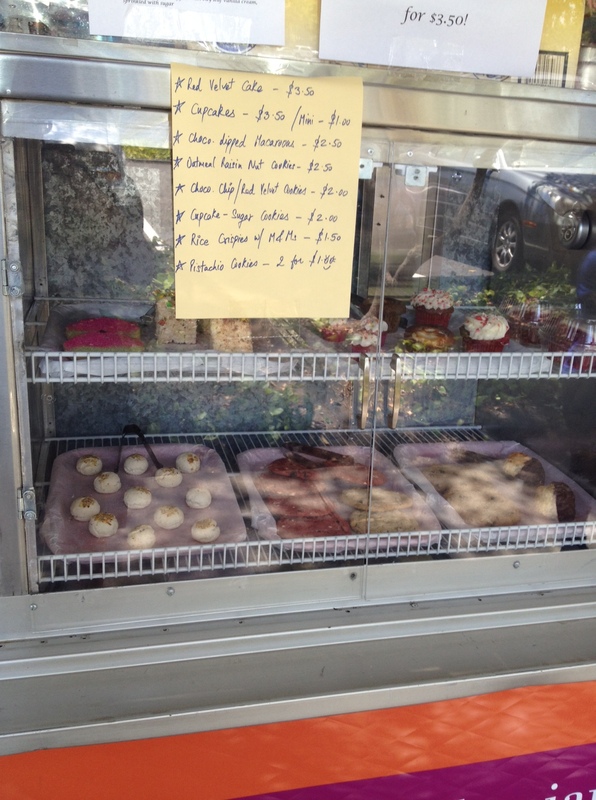 I was glad I had gotten a late start and arrived at 12:40 since SF Soupmobile hadn’t explained that in their post. I have a feeling the semi-private nature is what kept other trucks from advertising. I, however, felt like the luckiest person ever on Friday the 13th. 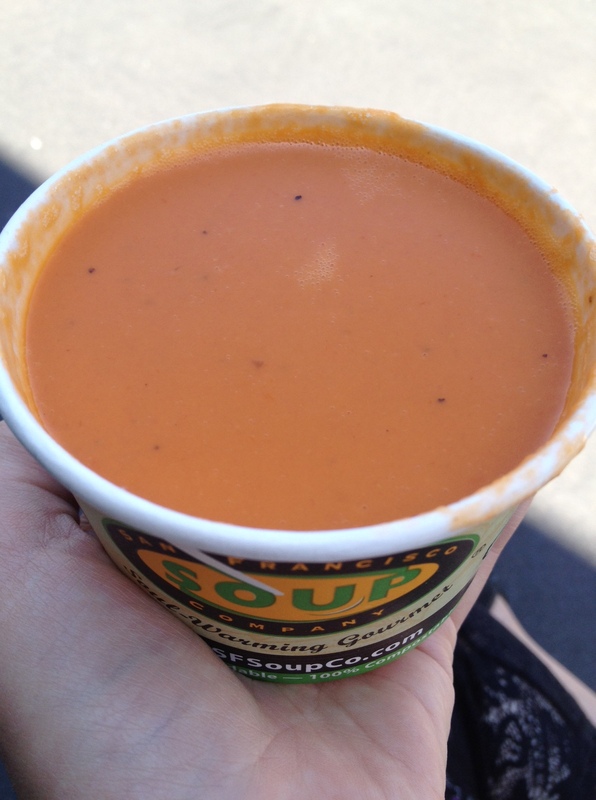 Despite all the options, I still had a craving for soup, so my first stop was SF Soupmobile where this time I got a small bowl of their organic tomato bisque. I should have waited awhile to devour it, but I couldn’t help myself and burned the top of my mouth and tongue in the process. As I wandered around the event checking out the other menus and weighing my options, I decided to glance at the menu at Road Dogs despite thinking they wouldn’t have anything for me. Lo and behold, I spied fine print at the bottom of their menu that said “any dog can be served veggie for $1 more”! I immediately felt quite silly for never checking out their menu before and always assuming they didn’t have anything vegetarian. However, when I went up to order they told me they were out of veggie dogs that day. I wasn’t thwarted for long, though, because I had also seen some different tater tot options on their menu. 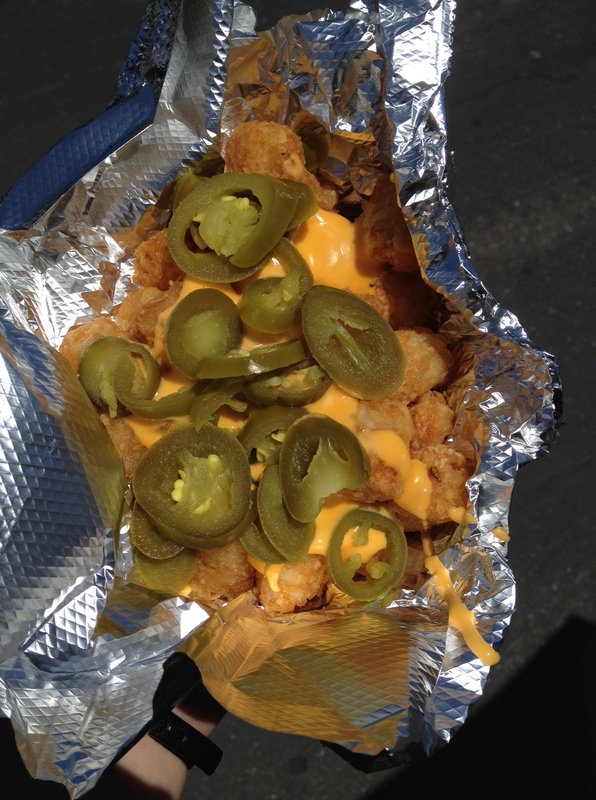 I went with the cheesy jalapeno tater tots. I was pleasantly surprised with how many tater tots came in the order. 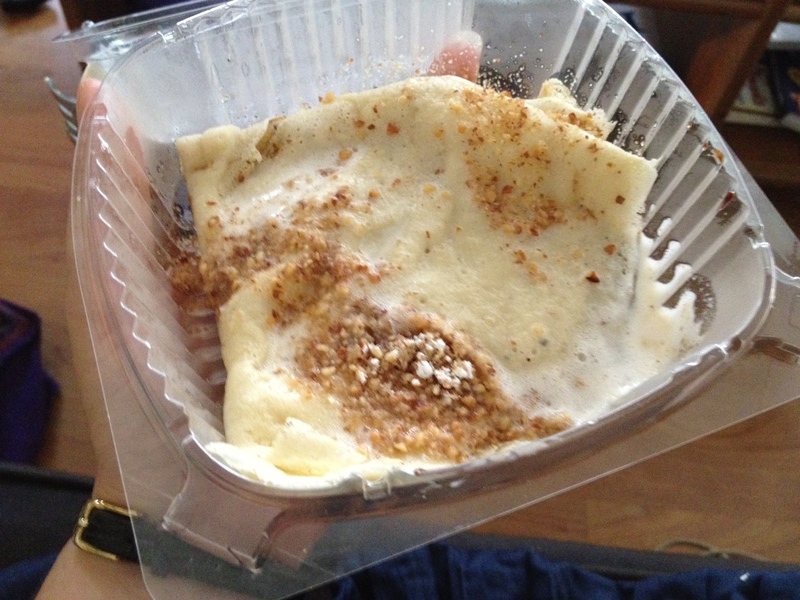 In fact, I started to run out of room in my tummy and had to take some of them home for later. Definitely worth the five dollars. 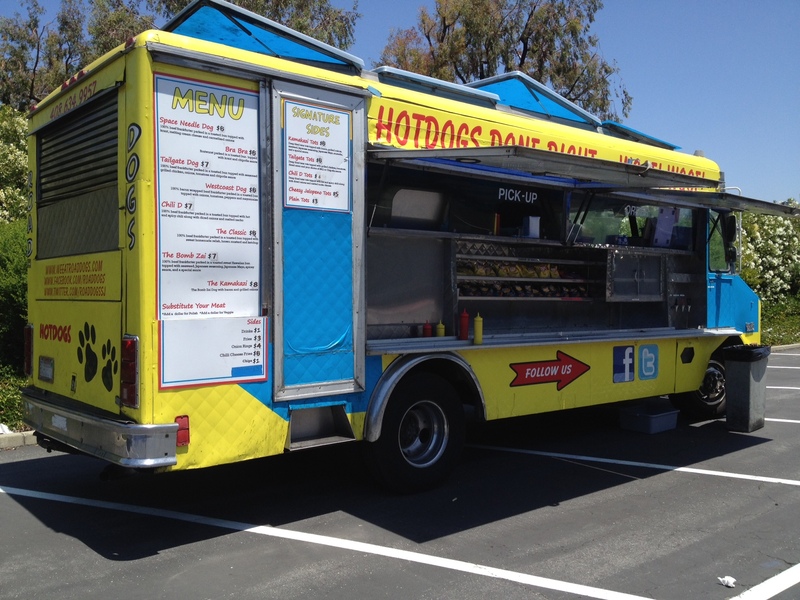 I look forward to trying one of their veggie dogs when they have them! My next stop was Truckin’ Sweet, which I had only been to once before and enjoyed. This time I went with their caramel brownie bash flavor, which consists of brownie pieces and caramel swirl in vanilla ice cream. 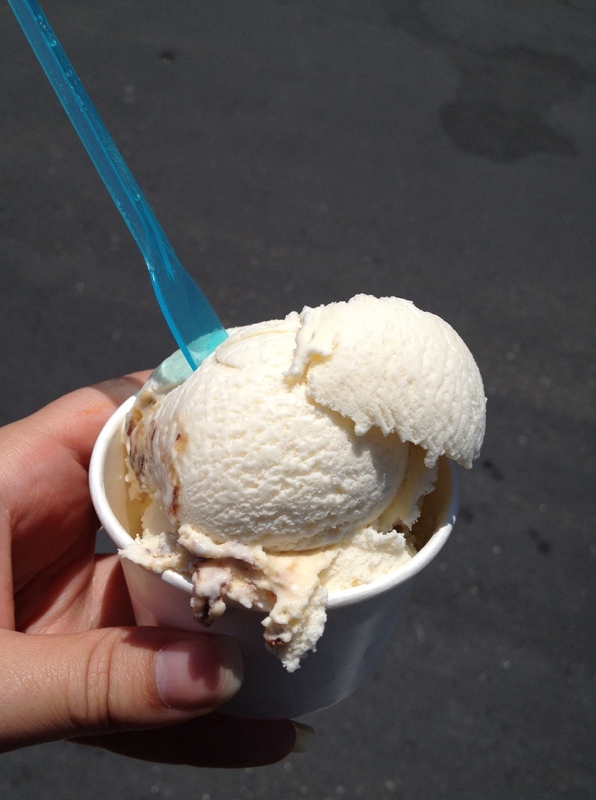 I found it to be more vanilla than anything else, but maybe I just got a scoop without much else in it. I tasted some of the caramel, but didn’t get much brownie at all. 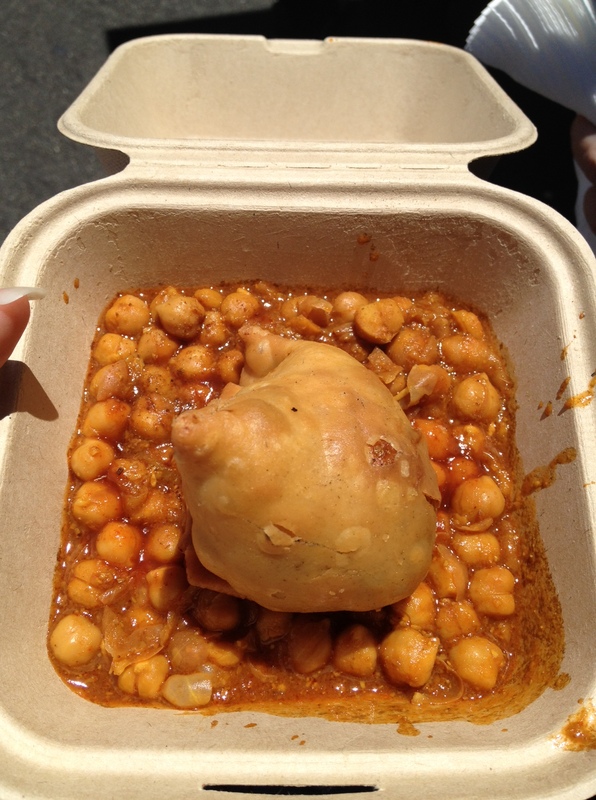 I think next time I’ll go back to the Voo Doo Crunch I enjoyed so much last time. My final stop was Oaxacan Kitchen to get some of their amazing churros to go. Again, I didn’t take a photo since I’ve posted them before. I can’t emphasize enough how great their churros are though! 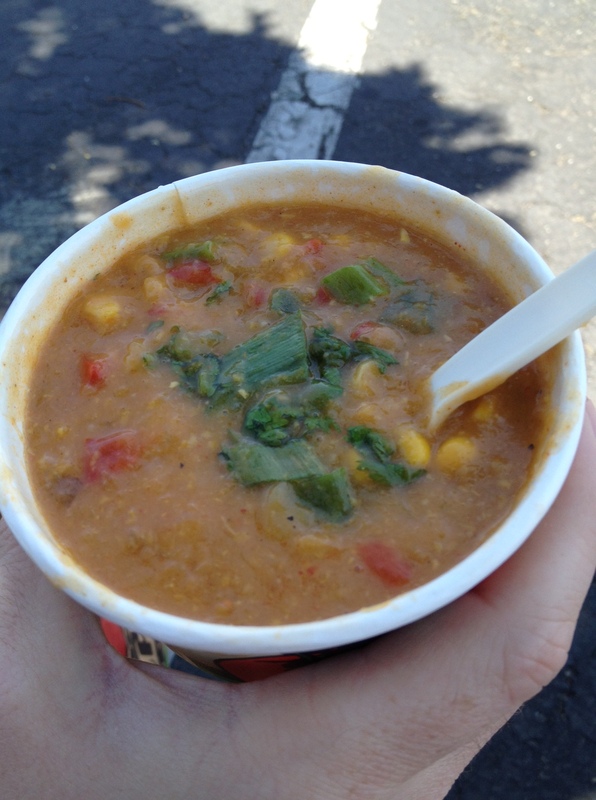 Today, like a crazy person, I went to SF Soupmobile yet again! 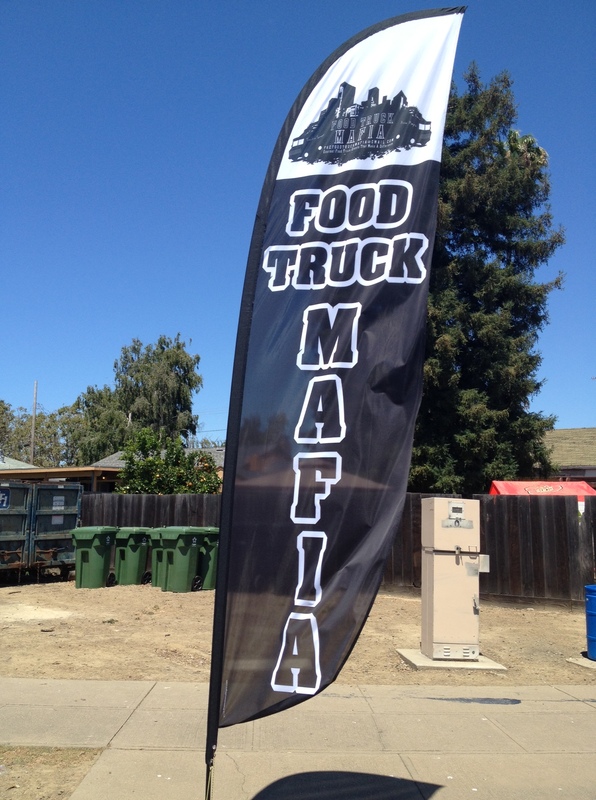 This time I mostly went because they were in Mountain View again, and Kyle hadn’t gotten to try them yet. Since he works too far from Mountain View to go there during his lunch break, I picked up lunch for both of us and met up with him closer to work. I was happy to try more from their truck too. 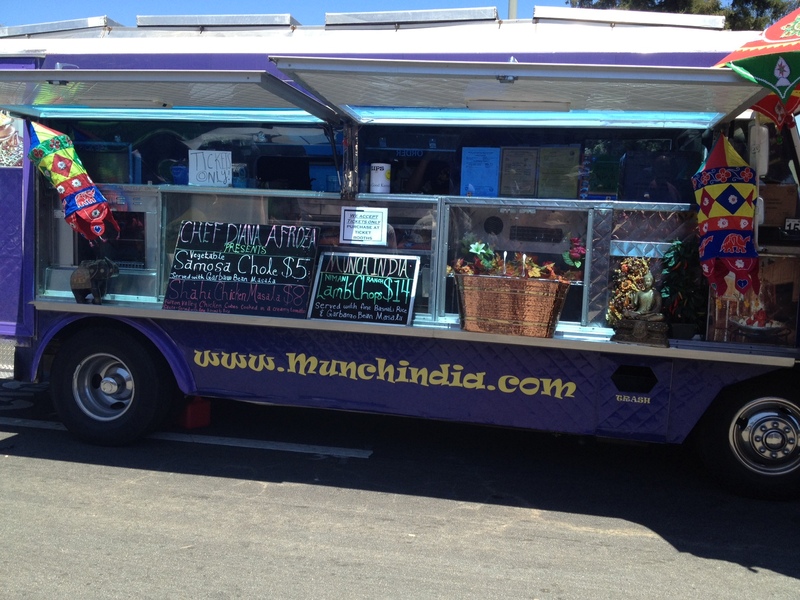 They have a rather expansive menu, and many vegetarian options. 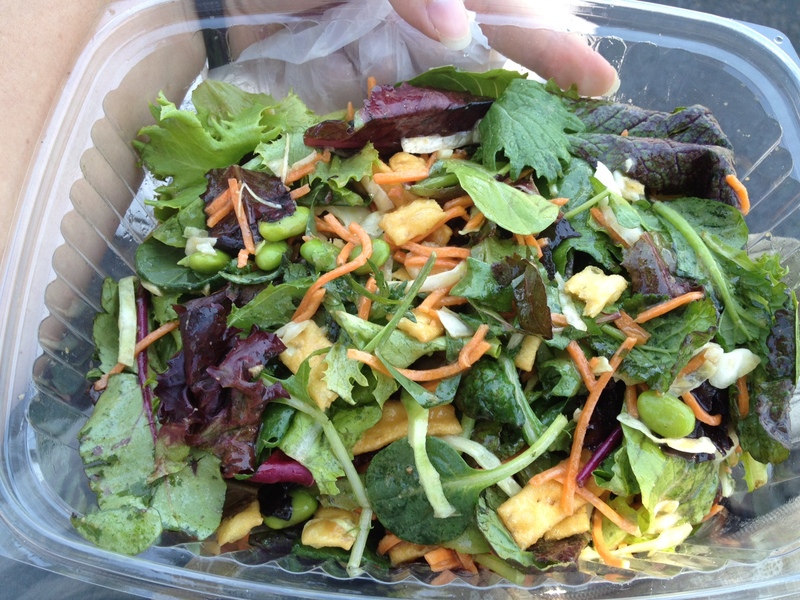 This time I went with a salad instead of soup since all of their salads can be made vegetarian. 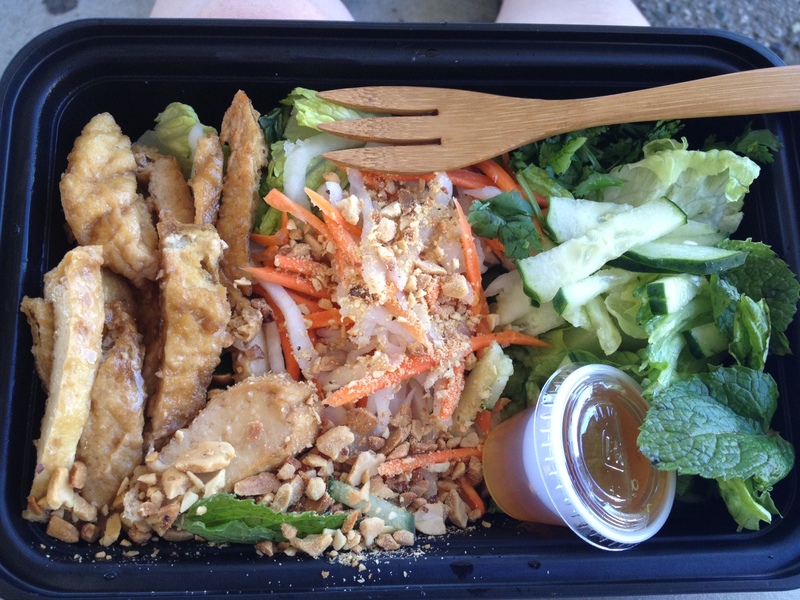 I got their Asian chicken salad sans chicken. It was as good as I hoped it would be, and I especially enjoyed the edamame and crispy wontons. There might have been too much dressing for some, but I love dressing so it didn’t bother me. 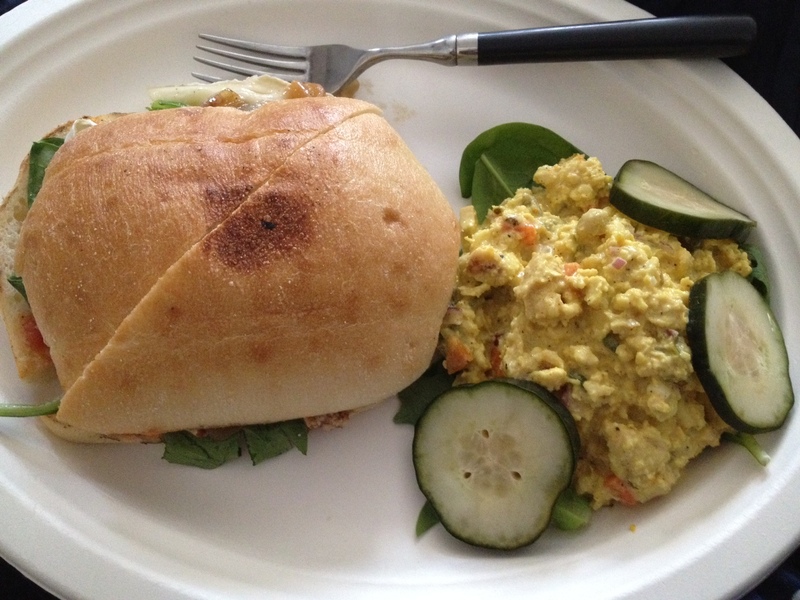 Kyle went for the organic southwestern corn chowder and a half egg salad sandwich. I had a bite of the chowder, and it was yummy. 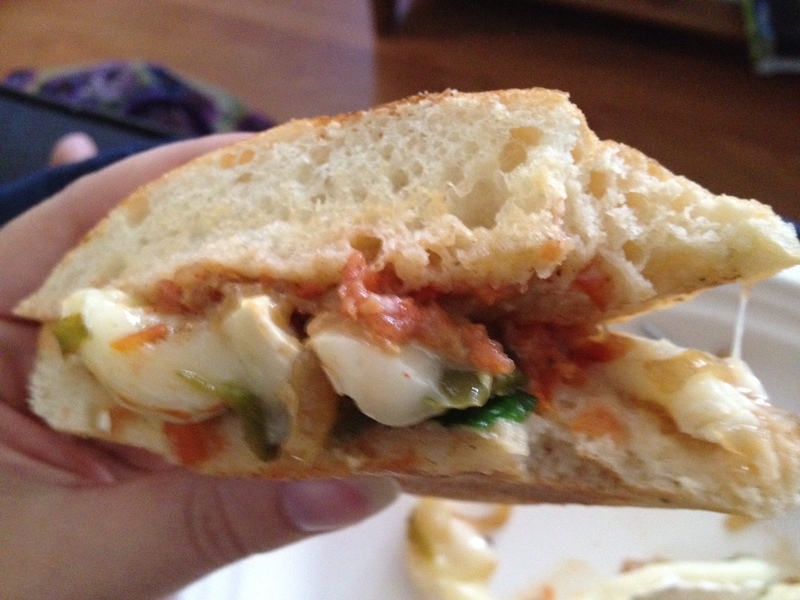 He said the same was true of the sandwich, and I have to believe he meant it because he ate it so quickly I didn’t get a photo of it before it was gone. Luckily I snagged one of the soup though! I probably won’t write before then, so I’m happy to announce that next week Kyle and I are going to Los Angeles to visit my sister, and I’m hoping to hit up some LA food trucks while we’re there. I can’t wait to mix it up with new trucks!